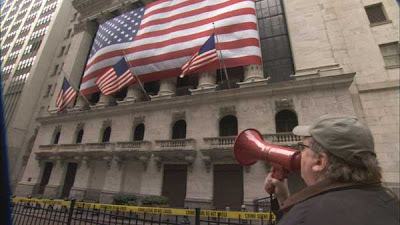 Michael Moore: I did find one guy on Wall Street who wasn’t a film critic. 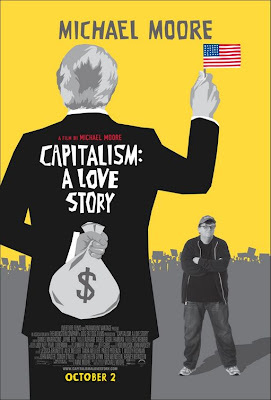 “Documentary” filmmaker, Michael Moore, has a knack for making movies about timely subjects. One could argue that he makes the movies he does when he does because he wants to affect change, therefore making him a hero. One could also argue though that he picks a topic he knows will hit all the right buttons to get people talking and to get them into the theaters. He wears his “Man of the Masses” hat and puts average Americans up on the screen to prove his points and then gets his following to come see them, led gallantly by himself, of course. Using the people to make money off the people is essentially everything he denounces in CAPITALISM: A LOVE STORY but Moore can’t see past his ego to see that. It’s easy to be a hater when it comes to Moore. I don’t want to be one but when each of his movies is seemingly more about him at times than anything else (did you know he wanted to be a priest when he was a kid? ), it is almost impossible not to criticize or question his intentions. Like his previous works, CAPITALISM is pieced together like a university term paper. Moore knows the point he wants to make and he finds a bunch of examples to prove that point while conveniently discarding any facts that might make his argument actually well rounded. He throws in random archival footage taken out of context to make fun of the bad guys and keeps the yuks coming with his own smug narration. When the situation is as bad as these crippling economic times though, Moore’s sarcasm is hardly necessary and barely welcome. CAPITALISM does tell some frightening tales. Moore’s examples are extremes but it is the extremes that are threatening the demise of capitalism after all. In Pennsylvania, for instance, a corporate owned juvenile detention center was opened to take the burden off the government and the taxpayer but eventually did far worse to the community. The company bought off judges and kids were incarcerated for minor offences with lengthy, lucrative stays. If that’s not bad enough for you, there are also companies out there taking life insurance policies out on their employees without their knowledge. When the employee dies, not to suggest that companies are killing their employees or anything, the already rich company collects and the surviving family struggles with funeral costs. Perhaps if Moore would allow more of these atrocities to speak for themselves, his voice would be better heard. You know Moore’s ego is somewhat out of control when he claims that he warned us about this collapse over twenty years ago when he put out his first film, ROGER AND ME. How could we not have heeded his cautionary counsel? If we had, perhaps all of this economic calamity could have been avoided. Herein lies the trouble with CAPITALISM: A LOVE STORY; sarcasm begets more of the same, not change. And while it is amusing from a popular culture standpoint to see Moore being refused entry to the General Motors headquarters in Detroit yet again, it only really serves as confirmation that Moore matters more to Moore than anything he supposedly stands for.